We had a good snowfall last Monday bringing joy to all those who love the snow. For a few days the city looked clean. Between my cameras being in for repairs and the slog of daily blogging last year, I am taking much longer pauses between blog entries. The good news - one of my cameras was repaired under warranty and I will be picking it up this week. By Thursday the temperature was close to freezing with even warmer temperatures predicted. This resulted in great puddles. Crossing streets was a particularly challenging activity as people picked their routes around the water hazards. It was lovely to be out. It's funny how in November when the temperature goes down to the freezing mark we all feel cold but by February when it goes up to the same temperature it feels warm. For the first time I walked hatless for a while. 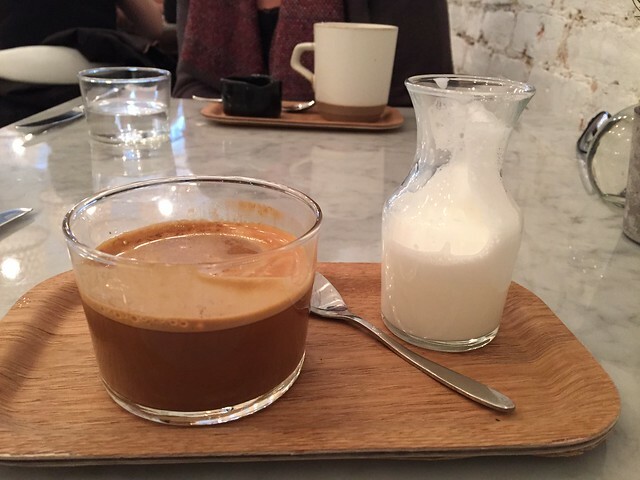 Delightful to have lunch and coffee at a new vegetarian restaurant, LOV. You never know what you will see when you walk. Winter can be hard on more than people. 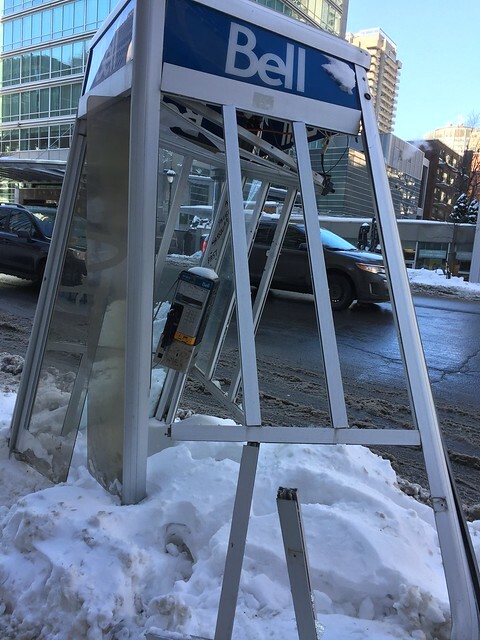 This phone booth reminded me of a cubist painting - probably the result of an altercation with a snowplow. Is this an allegory? The church cast in shadow while the commercial building is bathed in sunlight? 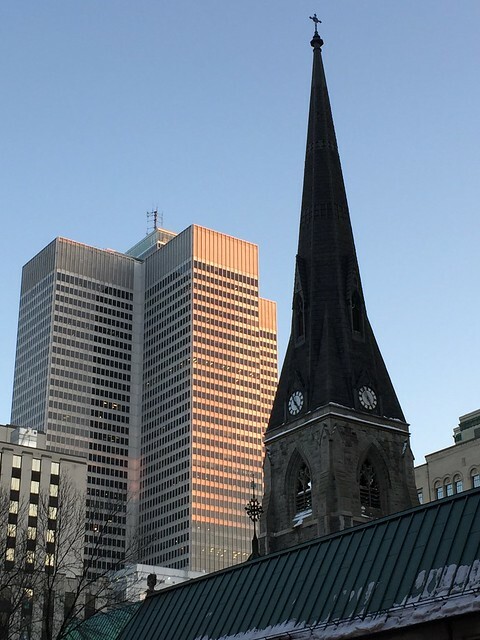 Christ Church Cathedral is the cathedral of the Anglican diocese of Montreal. Some years ago I wrote about how the church improved its finances by allowing a shopping mall to be built under it. So maybe the juxtaposition here of church and commerce is appropriate. Love to see the first photo. 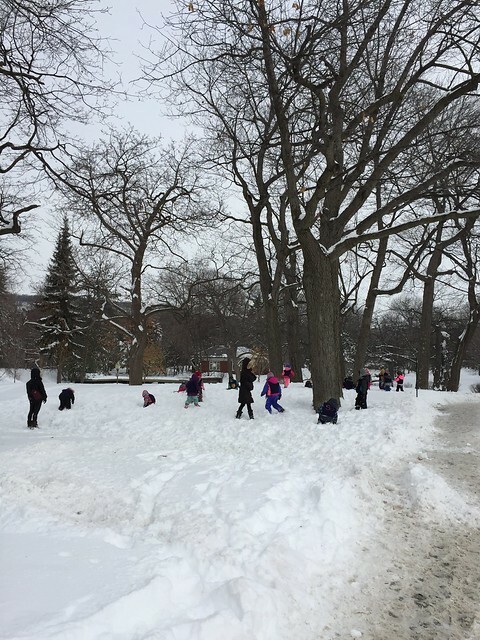 Children in the world do the same things, enjoying snow. Have a good weekend, Susan. In the first photo, I like the juxtaposition of monochrome and a little of some colors, stillness and action of the children. Has the juxtaposition of church and commerce created new effect? I wonder if there’s time when church is in the light and the commercial buildings in the shadow. Goodness, I haven't seen a phone booth in a long time! There is always light and darkness but perhaps commerce is winning?